Keeping a track of workout routines, calorie and carbohydrate intake and medical information had become quite a task in this fast paced world. This is why health and fitness had been suffering for quite some time. Not anymore. With iPhone fitness apps keeping track of exercise routines, food habits and maintaining good health has become a lot easier. iFitness is undoubtedly one of the most comprehensive iPhone fitness app available. Developed by Medical Productions, this app helps in providing a wide array of information about exercise routines. Moreover, iFitness also helps in performing the exercises correctly. The app has information about more than three hundred exercise routines complete with exhaustive instructions, videos and pictures. 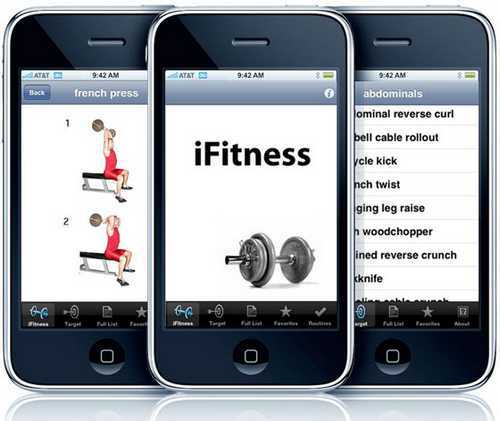 This app also enables the users to customize their list of exercises and perform them without errors. Therefore, using iFitness you can work on the parts of your body that you want to. iFitness also helps in tracking your progress and supports multiple users. It can be downloaded from iTunes Store for $1.99. Another extremely popular iPhone fitness app is the Runkeeper. The Runkeeper app uses the built in GPS technology in the iPhone to keep a track of all your fitness activities. 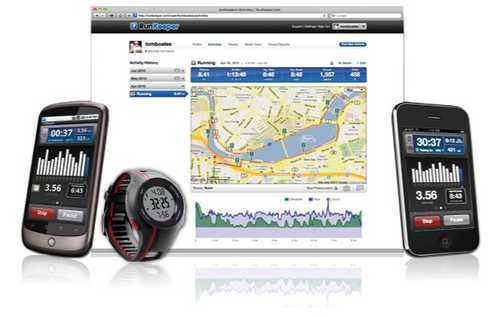 Runkeeper is user friendly and can be easily used to monitor activities like walking, running and cycling. Runkeeper allows manual entering of activities as well. Therefore, Runkeeper can also cover the time that you spend on your treadmill every day. The Runkeeper app syncs up to its web portal and you can view the exhaustive history and stats of your fitness activities. This app can be integrated with social networking sites also. Runkeeper can be downloaded from iTunes Stores for $9.99. For those who want to build up body strength, Hundred Pushups is definitely one of the most useful iPhone fitness apps. This app follows a six week rigorous training program which is extremely effective. In fact, this program builds up your strength in such a manner that you will be able to complete hundred pushups in a row after completion of the six week program. This is not a small feat by any means. This app helps in tracking and logging the progress as well. Developed by SoftwareX this app can be downloaded by iTunes Store for $1.99. Other iPhone fitness apps that are similar to Hundred Pushups are Twenty Chinups and Two Hundred Situps. iMuscles is an extremely interesting iPhone fitness app and it helps you to know your body and muscles a lot better. This app has the whole human body in 3D and this gives you a chance to understand which muscle effects which part of the body. Since you should never exercise without knowing what is happening underneath your skin, this is a very handy app. It is developed by 3D4 Medical.com, LLC and can be downloaded from the iTunes Store. The price of this app is $1.99. The Authentic Yoga by Deepak Chopra apps is a great solution for yoga enthusiasts. Deepak Chopra’s assistant Tara Stiles performs yoga while Deepak Chopra explains each of the postures and their benefits. This app can be downloaded from iTunes Store for $1.99. The biggest benefit of these apps is they keep you on the toe and substitute your gym instructor. The interactive interface of the apps keep track with your fitness progress and this up to date progress report urges you to do better. So, download the apps and start working out now!